NB: The app never ends: You can keep on clicking for as long as you like, and it will give you a cumulative total. 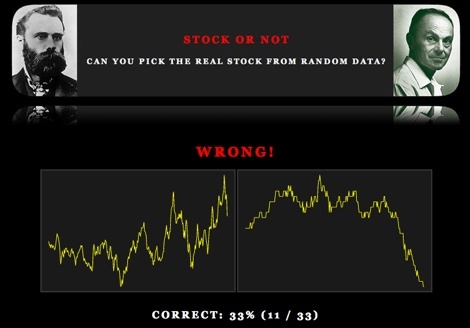 The more you click, the more accurately the percentage reflects your stock-chart-picking prowess. While I’m very surprised at how many people have spent hours playing this silly little game, what really surprises me is that some people are doing significantly well at it. It has now reached the time for me to pester my PhD econ buddy to suffuse me with some wisdom as to how to make more ‘realistic’ time series.